Fine Gael TD Helen McEntee. ON HER FIRST day in the Dáil, Fine Gael’s newly elected TD, Helen McEntee said it was an “emotional day for all the McEntee family”. The 26-year-old also said she owed a huge debt of gratitude to her family and Fine Gael supporters who knocked “on doors in Meath East for three tough weeks, through the hail, sleet and snow”. Deputy McEntee said she will continue to so the “good work” of her father but that she also wants to chart her own course, and develop her own causes, in particular, she said she wants to work on behalf of the young people in Meath East. 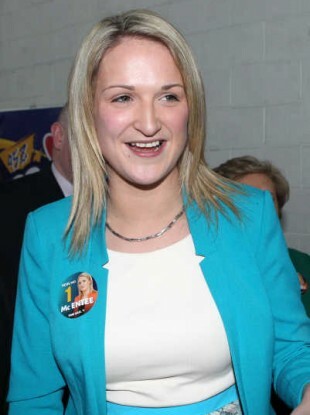 McEntee was elected in the Meath East by-election at the end of March. Email “Helen McEntee describes first day in Dáil as “emotional””. Feedback on “Helen McEntee describes first day in Dáil as “emotional””.